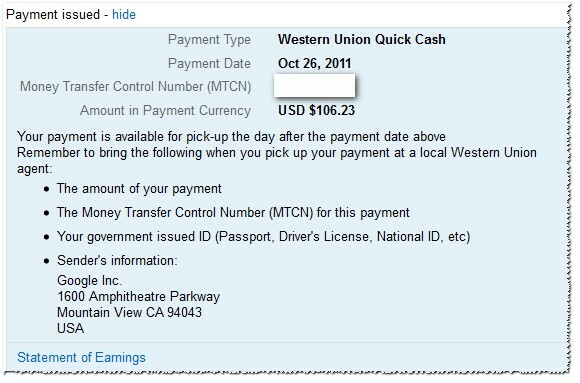 Home Adsense Bennixville My First Cash-Out: Adsense is really Real! My First Cash-Out: Adsense is really Real! Hi there.Just to share,yayks!I made my first Adsense cash-out from Google yesterday.Though its a only a little amount, I am very happy becuase it's very timeley to treat my GF for her birthday on November 4th. My Adsense earning only sum up to $106.23 of cash that worth around P4,500 in PH peso.I prefer Western Union to withdraw the cash and that was fairly easy that it only requires one company ID with the MTCN code sent by Google. This is first income actually in Google's Adsense with several months of blogging and it inspires me to exert more effort towards better conversion someday(More quality post + More traffic = More earnings-that's the simple formula for newbies). I count all my published post and I am surprised how I have written over 320 artciles now in Bennixville with over 30k visitors / month.That's plainly patience, research and hardwork to attain this stats. My top traffic referral are Google, YouSayToo, Bloggers and Facebook.Ty for reading hope you'll have your cash-out soon with Adsense!